Triggered spawn as part of the 9th coldain ring quest, or just using him to trigger the giants with a good plate armour quest drop rate (aka the Plate House cycle for those not actually doing the ring). This page last modified 2008-01-02 15:08:02. Got killstole by a couple jerks. I've read to just say the phrase again after clearing the room and some mention of 15 mins but I can't get the little **** to pop again. Does he have a timer? Edit: Came back 10 hours later, cleared the room, said the phrase and he spawned and died. I got to his part in the quest, I gave him the letter, he gave me the ring, the battle with the giants ensued. Once the battle was over though I couldn't find Doldigun at first. Then I saw him hightail it out of the room. by the time I caught up with him he was around the corner and out the door. At this time I got jumped by two giants, and near as I can tell he despawn...On a hunch I went back the next night and tried again without redoing the previous steps, and sure enough he dropped his head on death. So while failure in any other step would mean repeating back at the beginning. If you should fail this step, all is not lost. 2: stand on throne, say the line "the Dain shall be slain for the peace we must obtain." 5: Now prepare for a lengthy kungfu-tower style match where you fight a bunch of giants. Dont worry. Just keep killing them until the dwarf re appears and runs for the steps. he goes down like a sissy anyway. just have to catch him. ready a quick cast spear spell to tag him and he'll run back and get butchered by you. Once again, this guy is basically magic immune. Thanks SOE! A 70 SK in EP gear can solo to him with ease, but he's more dangerous than two giants, becuase I can't lifetap or anything. Lovely. Please advise as to what others might be thinking. this mob is on dragon/giant rules i'm guessing IE you have to be under him to land spells. Was he really immune or was every cast at distance from him? We've cleared the room on 3 seperate occasions for a total of 15 times and he's only spawned once. Any ideas to what I'm doing wrong? 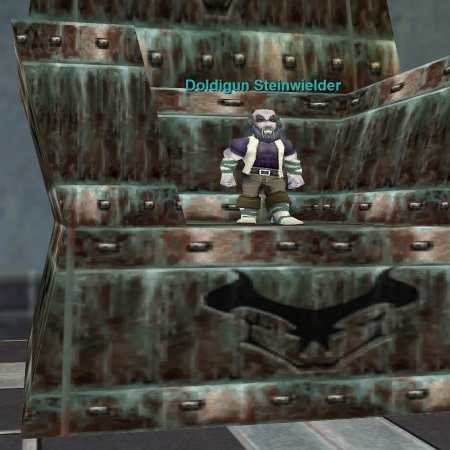 Just did the turn in of the note to Doldigin and then the plate cycle 3 times and Doldigin did spawn after killing all the giants any of the three times. 1/3/05. Might be a dumb question, but its called the Plate house cycle. Are there a cloth, leather and chain cycle similar? Helped a guildie take him out last night. First attempt didn't go so well. 2nd attempt worked great. He pops on the throne. Then after aggroing him 2 giants popped and attacked. Had tank and offtank (me) to control it. After taking down the first 2 giants. 2 more giants come out of the doors and attack you. Again, used the tank/offtank method. First set was blue and second set was white to a 54 pally. Afterwards 1 yellow con spawns. After that a red con spawns. After killing ALL of these then the dwarf decides to book it. The 2nd spawn of the dwarf was yellow to me. All except the dwarf have tons of hps and takes some doing to whittle down. The first 2 sets of giants can be rooted/snared. Dunno about the rest as nothing ever stuck. Did this with a 64 war, 54 pally offtank (me), 61 rogue, 63 druid, 64 necro and 61 cleric. Rogue backstabbed my mob whilst the necro/war took care of the other mob. Fun overall just a bit rough. How hard is it to kill the 2nd spawn? Is he really level 60? Does he cast? The one who drops the head was dark blue at 61 and an easier kill than the giants... hardest part was stopping him from running, I targetted him as he was running away and sent my pet in, then the other players piled on. I don't remember him casting or resisting any spells (think I used Funeral Pyre and Bond of Death, maybe Neurotoxin too since he was the last mob and I had mana to burn). There are 2 of these. The first one spawns when you say "The Dain shall be slain for the peace we must obtain." and is green to a 65. Aggro him with anything and he depops and 2 giants spawn. The second spawns after the final boss (You will know him because you cant land anything on him). THis one is 60 and is exactly like the last boss. No spells land and such. If you let him go, you cant respawn him for 2 hours. If you kill him, you can instantly respawn the cycle. Used trigger phrase "The Dain must be slain for the peace we shall obtain". It worked for me. Not sure if you can say it any other way or not but just thought I'd throw that out. It seems to me that as long as you kill the dwarf, you can start the cycle whenever, possibly even right after the dwarf died. We usually wait about 15 minutes so we could kill the respawns but I don't think there is a timer. is there a limit on how often he can be used to trigger the cycle? He spawns on the throne (loc neg 800 pos 1150) in the south-east corner of the zone. To spawn him, clear the room, stand on the throne and say "the Dain shall be slain for the peace we must obtain." When I handed him the note, he gave me a "Coldain Council Ring??? "(name very close to that - didn't screenshot it - but different from the "Juliash Lockheart's Ring" I expected from researching this quest). He dissappeared for a couple moments, then respawned running for the exit. The "Coldain Council Ring??" was successfully given to Juliah Lockheart (respawned the traitor version) and the final part of ring 9 was completed. My group made the mistake of first going to the throne area in the most southern end of the zone (loc neg 1400, pos 1700). Room is more correctly called "Icewell Keep" to my knowledge.